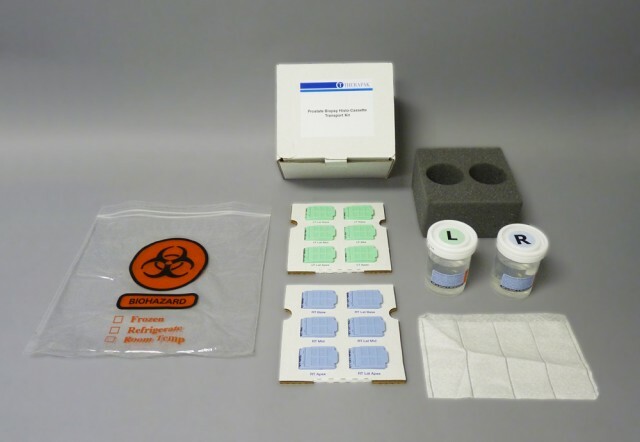 This transport kit features all the necessary devices used to collect tissue and blood for pathology testing. To ensure safe transport, all supplies are placed into appropriate cushioning material with an absorbent pad and secondary leak resistant bag. The kit can be placed inside a carrier shipping envelope with attached air waybill. Therapak manufactures five variations of prostate biopsy collection and transport kits. All kits feature standardized components to maximize the ease of collecting and packing specimens for transport. Primary receptacles in the form of 20 mL jars are 95 kPa certified for transport in compliance with DOT and IATA standards for leak resistant transportation. The kits come with either six, eight, twelve, fourteen or sixteen 20 mL jars pre-filled with 10 mL of formalin solution. Jars are secured by a corrugated insert and placed into the provided zip-style biohazard bag with absorbent material for transport. Corrugated inserts are printed with the prostate biopsy location ID for easy recognition. In addition, a set of jar labels with the location ID is included in the kit to ensure proper placement of the specimen jars at the point of packing and identification once received at the test location. Customization of these kits is available upon request. Tissue biopsies are commonly used in pathology laboratory testing to diagnose disease. This collection and transport kit allows trained physicians to collect and transport biopsy tissue to diagnose prostate cancer, neoplasm, the cause of prostate enlargement and other prostate related abnormalities. Provided preprinted histology cassettes reduces error and saves time by transferring biopsies to the cassettes during the collection process rather than at the testing laboratory. Once you have collected the biopsy specimen in accordance with established protocols, each preprinted biopsy specimen cassette can be placed into the color coded prefilled formalin vial. 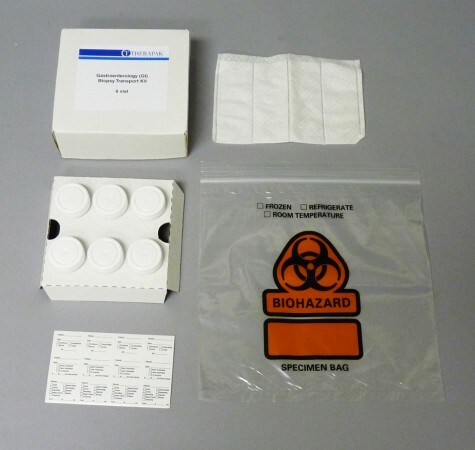 Once the completed test requisition is placed into the provided biohazard bag with absorbent, the kit is ready for transport to the laboratory via a preferred courier. Packing and shipping instructions are located in each kit. 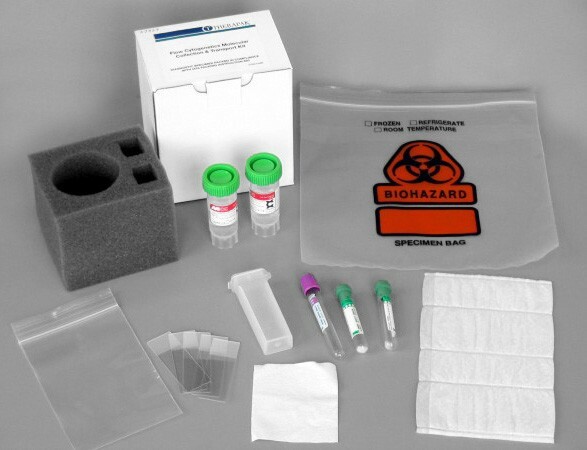 Therapak offers two variations of GI biopsy collection and transport kits. Both kits feature standardized components to maximize the ease of collecting and packing specimens for transport. Primary receptacles in the form of 20 mL jars are 95 kPa certified for transport in compliance with DOT and IATA standards for leak resistant transportation. The kits come with either two or six 20 mL jars pre-filled with 10 mL of formalin solution. Jars are secured by a corrugated insert and placed into the provided zip-style biohazard bag with absorbent material for transport. Corrugated inserts are printed with the GI biopsy location ID for easy recognition. In addition, a set of jar labels with the location ID is included in the kit to ensure proper placement of the specimen jars at the point of packing and identification once received at the test location. Customization of these kits is available upon request. This kit provides a test-specific range of components designed for modern Urine Cytology / FISH Testing. 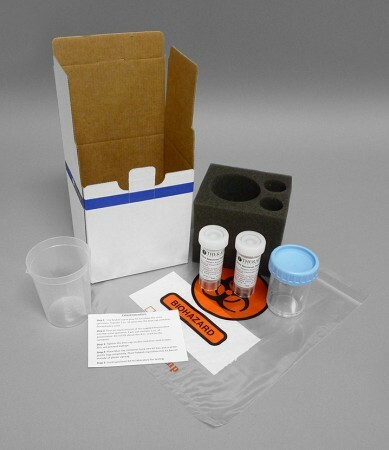 The primary collection container is pre-filled with a urine preservative solution suitable for maintaining specimen viability after the urine content is transferred into the container for transport to the laboratory. To use, simply pour two ounces of urine into the blue cap container. Transfer two 1 ounce vials of preservative into the blue cap container. Tighten the cap until you hear it click. Place the container into the foam insert. Seal the bag, close the box and prepare the kit for shipment using a carrier envelope and air waybill. Kit includes: shipping box, foam insert, collection cup, primary container with preservative admixture, and a transport bag with absorbent. 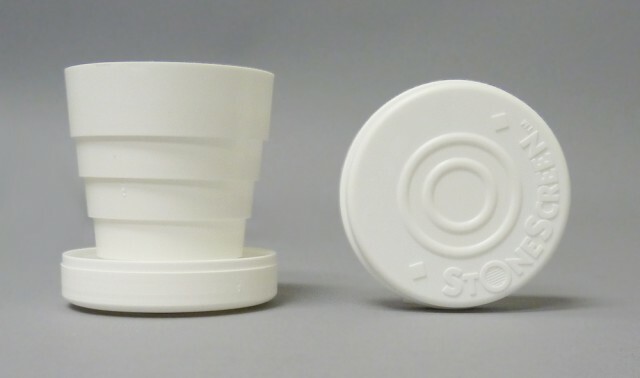 The StoneScreen™ kidney stone collection cup was constructed to capture renal calculi and for use with patients attempting to pass stones following extracorporeal shock wave lithotripsy. The urine-straining device is a collapsible plastic strainer cup designed for both men and women and includes a nylon screen at the bottom of the cup for stone capture. Once the stone is captured, it can be placed in the storage space under the lid and saved for analysis. The StoneScreen™ collection and transport kit provides a means of collecting and transport kidney stone samples for laboratory analysis. 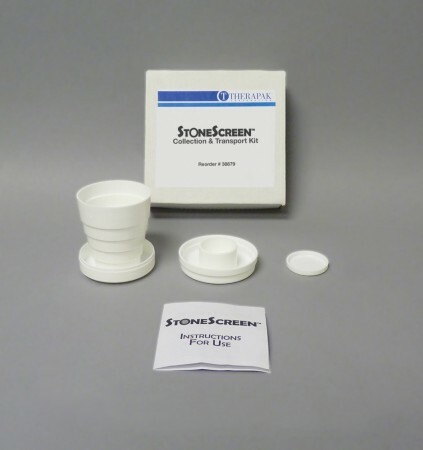 The kit features the StoneScreen™ kidney stone collection cup that is constructed to capture renal calculi and for use with patients attempting to pass stones following extracorporeal shock wave lithotripsy. The urine-straining device is a collapsible plastic strainer cup designed for both men and women and includes a nylon screen at the bottom of the cup for stone capture. Once the stone is captured, it can be placed in the storage space under the lid and saved for analysis. After the entire cup and sample is re-collapsed following collection, place the specimen cup into the zip style bag and return the specimen cup into the transport box along with the test requisition for courier pick up.